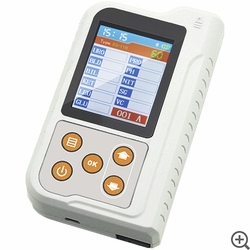 The FL-401 Urine Analyzer is a high-precision, intellectual instrument developed from research based on modern optics, electronics, computer science and other advanced technologies for a clinical inspection of urine. Glucose (GLU), Bilirubin (BIL), Specific Gravity (SG), Ketones (KET), Blood (BLO), Protein (PRO), Urobilinogen (URO), Nitrates (NIT), Leukocyte (LEU), Intravascular Contraction (VC), Ph Acidity (PH), Malonic Acidemia (MAL), Creatinine (CR) and Urinary Calcium (UCA) in urine can be tested by using special test strips. This device is applicable for use in hospital, community health service, clinic, epidemic station and family homes, etc. Test items: GLU, BIL, SG, KET, BLD, PRO, URO, NIT, LEU, VC, PH, MAL, CR, UCA (optional based on the type of test strip). Specified EMC, climate and mechanical environment description: don't use the device in environment with direct sunlight, the front of open window, flammable and explosive gases, near the heating or cooling equipment, near strong light-source, otherwise it will influence normal use of the device. Specified EMC, climate and mechanical environment description: the packed device should be stored in room with no corrosive gases and good ventilation. Temperature: -40C - +55C, relative humidity: less than or equal to 95%, and avoid severe impact, vibration, rain and snow during transportation.